Preface. Part I Preliminaries: A Review of Relational Concepts. An Overview of Tutorial D. Part II Laying the Foundation: Time and the Database. What Is the Problem? Intervals. Opeartors on Intervals. The EXPAND and COLLAPSE Operators. The PACK and UNPACK Operators. Generalizing the Relational Operators. Part III Building on the Foundations: Database Design. Integrity Constraints I: Candidate Keys and Related Constraints. Integrity Constraints II: General Constraints. Database Queries. Database Updates. Stated Times and Logged Times. Point and Interval Types Revisited. Appendixes: Implementation Considerations. Generalizing the EXPAND and COLLAPSE Operators. References and Bibliography. Index. Temporal database systems are systems that provide special support for storing, querying, and updating historical and/or future data. Current DBMSs provide essentially no temporal features at all, but this situation is likely to change soon for a variety of reasons; in fact, temporal databases are virtually certain to become important sooner rather than later, in the commercial world as well as in academia. This book provides an in-depth description of the foundations and principles on which those temporal DBMSs will be built. These foundations and principles are firmly rooted in the relational model of data; thus, they represent an evolutionary step, not a revolutionary one, and they will stand the test of time. Preliminaries: Provides a detailed review of the relational model, and an overview of the Tutorial D language. Laying the Foundations: Explains basic temporal data problems and introduces fundamental constructs and operators for addressing those problems. Building on the Foundations: Applies the material of the previous part to issues of temporal database design, temporal constraints, temporal query and update, and much more. Appendixes: Include annotated references and bibliography, implementation considerations, and other topics. Describes a truly relational approach to the temporal data problem. Addresses implementation as well as model issues. Covers recent research on new database design techniques, a new normal form, new relational operators, new update operators, a new approach to the problem of "granularity," support for "cyclic point types," and other matters. Includes review questions and exercises in every chapter. Suitable for both reference and tutorial purposes. C. J. Date has a unique stature in the database industry. Author or coauthor of well over 30 books on database management (including the bestselling An Introduction to Database Systems, currently in its 8th edition), he enjoys a reputation that’s second to none for his ability to explain complex technical issues in a clear and understandable fashion. He was inducted into the Computing Industry Hall of Fame in 2004. Hugh Darwen was employed in IBM’s software development divisions from 1967 to 2004. In the early part of his career, he was involved in DBMS development; from 1978 to 1982, he was one of the chief architects of an IBM product called Business System 12, a product that faithfully embraced the principles of the relational model. He was an active participant in the development of the international standard for SQL (and related standards) from 1988 to 2004. Based in the UK, he currently teaches relational database theory at Warwick University and is a tutor and course development consultant for the Open University. He has written two books on database management as well as coauthoring several with C.J. Date. He has received honorary degrees from the University of Wolverhampton and the Open University. Nikos A. Lorentzos is a Professor at the Agricultural University of Athens. He is mainly known for his research in temporal (and also in spatio-temporal) databases. He has participated in relevant European Union funded projects (prime researcher for the development of a Temporal DBMS). 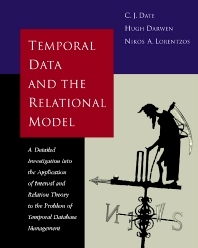 The temporal model he has proposed has been extensively evaluated by independent researchers with positive comments, it is decribed in books addressed to university students, it has been the basis of PhDs undertaken in Europe and it has attracted the interest of DBMS developers. He is co-editor of the book Spatiotemporal Databases: The Chorochronos Approach (spatio-temporal databases). He is active in Temporal, Spatial and Spatio-temporal Databases as well as in the development of DSSs and Expert Systems in the forestry and the agricultural domain.